Below is photos of the Pallet Emergency Home designed for people who are homeless / living in war torn regions / recovering from a recent tsunami / etc. 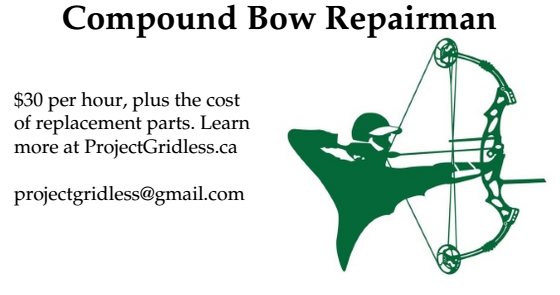 It Can Be Built in One Day With Only Basic Tools. Or so says the (idiotic) websites promoting it as an emergency place to live. It was designed by an architectural design firm which apparently doesn't know what wind and rain are - and are clueless about heating - and are selling the building designs for $75 a pop. I can guarantee the people buying the designs are equally foolish to fall for this badly designed bit of architecture. Honestly, while I like the concept of quick buildings that anyone can build, there are some inherent design faults with making a temporary house out of old wooden pallets. #1. No fireplace or chimney. So how are you planning to keep warm inside there because it also has no electricity. You can't build a fire, the place would start on fire. And adding a wooden chimney - again, fire. #2. Pallets will be incredibly drafty. Lets face it, they're designed with lots of holes in them. Sticking some plastic up the middle of the pallets does NOT solve the draftiness problem. It needs to be well nigh air tight to prevent drafts from sucking out all the heat. The design firm does say you can add insulation / better walls to the house, but that would be if you wanted to try and make it more permanent. The concept here is for a temporary house. Adding proper insulation would be a waste of time and money for something you are planning to garbage later. #3. Where are you supposed to find 110 pallets in perfect condition? 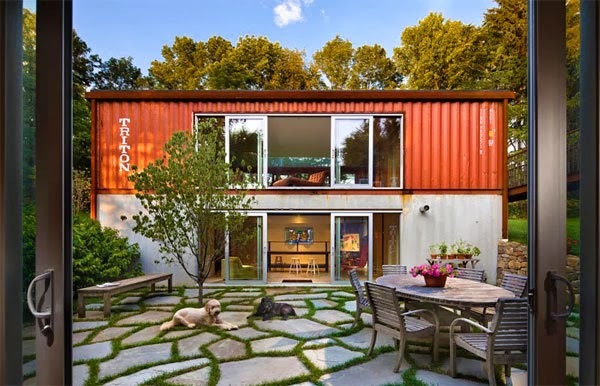 You can buy two large train shipping containers for less than $5000, and they will be steel - not drafty - and you can add a fireplace to the place - and it can be made into a permanent structure instead of a temporary home. #4. Pallets are not made to withstand weather. Pallets are designed to be cheap ways of carrying things inside storage facilities using a forklift. They are not designed to withstand the elements. They break easily. They're not meant to be rained on. The wood will start to rot / grow mildew. They're not the right type of wood to be used for building something outdoors. The mold and mildew would make you sick after the first rainstorm and the building would become unlivable. 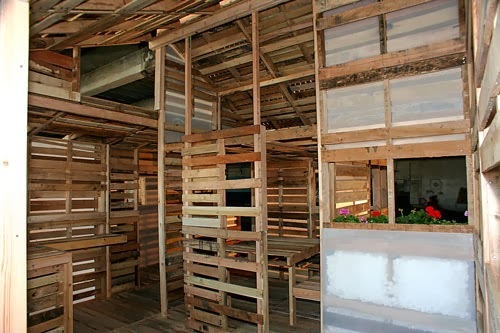 The original idea for the pallet house was for refugees returning to Kosovo to build temporary structures using wooden pallets (where are thousands of refugees supposed to find millions of wooden pallets???) and the designers apparently ignored the problem that Kosovo is a place that gets snow 4 months of the year. A single strong snowfall on top of the pallet house would COLLAPSE THE ROOF in on anyone living inside it (assuming they didn't already die from the cold) and any survivors of this faulty design would need to build a new shelter that can withstand heavy snow and keep them warm. #6. A tent would be infinitely cheaper. You can get a 12 person / 3 room Ozark tent for just $325 on Amazon.com - so that is pretty cheap. 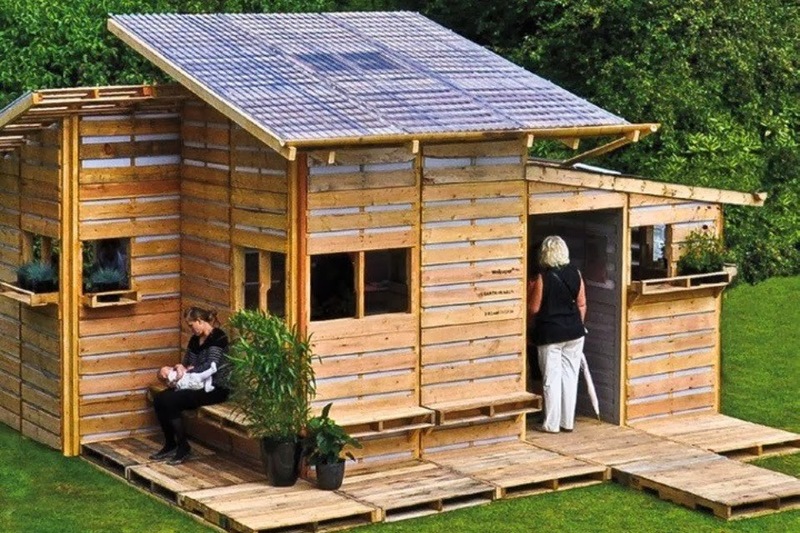 A temporary house made out of wooden pallets is neither cost effective or a good place to live in. It would be an unlivable place to live in after the first rainstorm, unable to withstand heavy snow, impossible to heat and a death trap. If you need cheap temporary homes think tents or shipping containers. At least with shipping containers you get way more benefits and the possibility of turning it into a permanent structure.